Summer is the season when we can feel most open and inspired to follow our passion and joy. manic or obsessive about things, and feel sad or not connected to other people. Foods that are important for Summer are corn, polenta, bitter greens, salads, and tofu. These foods nourish and regulate the heart and small intestine helping absorption and circulation in the body. By adding these foods to your diet, you’ll feel less tense and impatient, your thinking will be clearer and you’ll feel more connected to life and people. With the seasonal change from Spring to Summer cooking methods become lighter and shorter. Stir-frying, steaming, and light boiling are the main cooking methods for the season. Vegetables are chopped finer or in matchsticks for quicker cooking. Salt and tamari are used in smaller amounts. Corn is harvested at this time and is the most suitable grain for the season. Sea vegetables can also be used as condiments or in light-pickled salads. Small amounts of fresh summer fruit can also be used with meals as they provide a cooling effect. The Tripe Heater meridian regulates the heat in the three systems of the upper body (respiratory/digestive), middle body (circulation/excretory), lower body (nervous system). When the Triple Heater meridian is functioning well, we feel more balanced and connected to ourselves on the internal level as well as to others on the external level. Triple Heater Meridian Point 8 (TH8 ) is located 6 finger-widths from wrist crease in line with ring finger. It is a good point for symptomatic relief of shortness of breath. 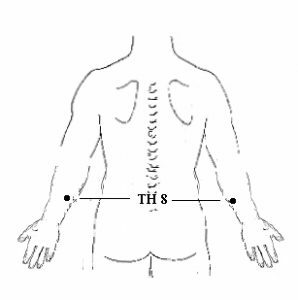 Using the thumb or finger apply pressure until you feel the soreness in the point. Taking deep breaths and maintaining the pressure breathe slowly in and out of the point until you feel the tension and pain disappear. The above technique is for symptomatic relief only If symptoms persist please consult a qualified shiatsu therapist for a full treatment. Remove the corn off the cob, grate carrots and onion mixing it with the corn. Add in wholemeal flour, arrowroot, water, and tamari and mix well. Heat up frypan with sesame oil then drop 1-2 tablespoons of mixture in frypan and let fry until brown. Then turn over. Serve with steam vegetables, noodles or rice. This pose tonifies the liver, spleen, and kidneys, and helps with digestion. Sit on the floor with one leg straight and the other bent pressing the sole of the foot against the inner thigh. Inhale, and as you exhale stretch forwardto grasp your ankle with both hands. Inhale and then exhale slowly trying to touch your chest to your knee. Hold the pose and breath deeply for two breaths. Exhale and slowly return to starting position. Repeat with the other leg bent. 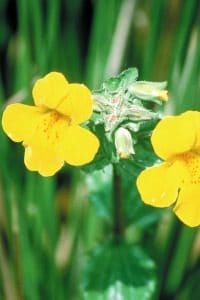 Mimulus can be taken when we have fears or anxieties about something specific, such as: an upcoming interview or exam, spiders, the dark, being alone, pain, flying, and separation. It can also be used when we are highly sensitive to our environment including the people around us. Spiritually, Mimulus can be helpful when we get too caught up in negative thinking and have lost our faith in life, the Universe, or God. Taking Mimulus can help us regain a truer perspective and realise that fear is a something we project from our minds into the future. It can support us staying in the moment and being able to deal with each minute, hour and day as it comes. General dosage is 4 – 5 drops under the tongue at least 3 times a day, or whenever we feel discouraged, anxious, fearful, or shy. Take a deep breath in, hold it for a moment and as you breathe out slowly, close your eyes. Take another deep breath and imagine your arms spread with palms open to receive whatever the Universe may have to offer you. As you breathe in, imagine the sun. Feel the warmth and glow of its rays on your face. Feel your whole body start to glow, first your face then neck and shoulders, chest, arms, torso, back and legs. Feel the heat start to gather in your lower abdomen just below the navel, and imagine the heat igniting inside of you to create a furnace of raw energy. Feel the intensity of that furnace and understand that this is the source of all your energy and power. From that furnace, let the energy stream forth to all parts of your body until it is coming out of your mouth, eyes, ears, fingers and toes. 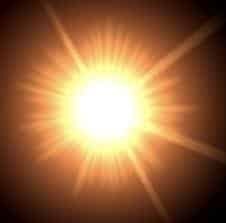 Let that energy stream forth into the world like a spark that ignites the flames in other peoples’ hearts. Feel the inspiration and joy as they too light up and become powerhouses and lighthouses to each other. Feel yourself becoming one with all things connected to them by all the energy of the Universe, and smile to yourself. Then in your own time, when you’re ready to return, slowly become aware of your surroundings and the room you’re in. Slowly open your eyes, feeling rested and refreshed. and never take any essential oils internally.